Udupi: Fed up of caste and religion based politics as well as rampant corruption, Akhil K Gowda (25), a young engineering graduate from Sullia who runs an NGO named "Yuva" in Mysuru is on a solo cycling mission across the state with the objective of creating a political awareness in the society. His cycle jatha with the slogan "Vote for Clean Politics" will cover 3,000 kms. Son of Krishnappa Gowda of Jalsoor in Sullia taluk, Akhil who commenced his jatha from Mysuru on January 12 arrived in Udupi district on January 16, Tuesday. He cycles 80 kms every day right from 8 am to 6 pm and intends to complete his mission within 35 to 40 days. 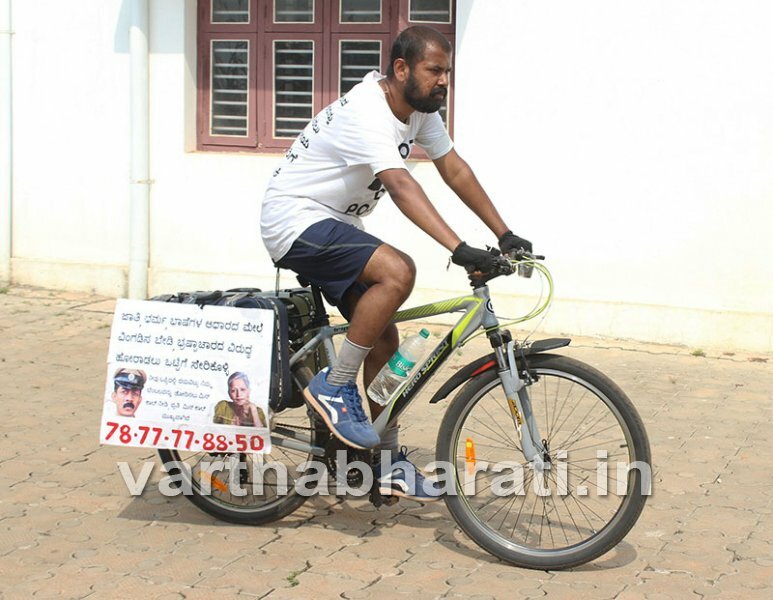 His jatha commenced form Mysuru on January 12 and he has covered Hunasuru, Madikeri, Puttur, and Mangaluru before arriving in Udupi thus cycling nearly 300 kms. He will proceed towards Kundapur, Karwar, Hubballi, Bijapur, Hyderabad Karnataka Region, Kolar and Bengaluru and conclude his jatha in Mysuru. His Cycle is filled with several posters stating "Do not create divide on the basis of religion, caste and language, Join Fight against Corruption, If you agree give a missed cal to 7877778850." Akhil is an Electrical and Electronics Engineering Graduate from Visveshwaraiah Institute of Technology of Mysuru. His Yuva NGO has around 200 members and it has engaged itself in several social service activities including installation of solar lamps to 300 houses of poor in 2016 and 250 houses in 2017. He says his jatha also aims at offering tribute to slain journalist Gauri Lankesh and DySP Ganapathi who had committed suicide.